Energy is one of the most important concepts in science, but it is hard to define in just a few words. What is energy? We say that small children "have a lot of energy." They are always running instead of walking, jumping instead of stepping. We also say that we need to eat to gain energy after spending a day working, moving heavy objects. We also can say that the blocks in the walls of our high school have energy. We can summarize all these examples of energy by saying an object has energy if it can produce a change in itself or in its surroundings. the ability to do work (this definition does not describe all kinds of energy, but will suffice for our study of mechanical energy.) The SI unit of energy is Joules. Work and energy are interrelated. If you do work on, you get something as a result of your efforts. If work is done on a particle, its speed is changed. 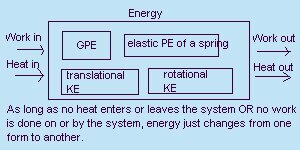 We relate the motion of the particle to the work done using a property called kinetic energy. It takes work to make an object move and a moving object can do work. energy due to the motion of an object; if an object has speed, it has kinetic energy. If an object's mass is doubled, its kinetic energy is doubled, but if its speed is doubled, its kinetic energy is quadrupled! Sometimes an unbalanced force causes acceleration, but without doing work and thus no loss in energy. An example would be the moon revolving about the earth. The moon is centripetally accelerated by the gravitational force between it and the earth. The speed of the moon as it revolves about the earth is constant. No work is done (there is no change in kinetic energy) because the force is perpendicular to the direction of the moon's movement. energy due to an object's position. energy can be transformed from one form to another in an isolated system, but it cannot be created or destroyed. The total energy of the system is constant. the total mechanical energy of an object remains constant as an object moves provided that no work is done by forces other than gravity.